The soldiers moved to the Lake Chad axis when they received intelligence report that some gunmen were sighted with abducted school girls moving to the area. The soldiers decided to leave the town for Lake Chad to confront them, but Boko Haram struck just an hour after they left. Continue below. They came at night and people were already sleeping. They started burning houses and shops and those who tried to escape from the burning houses were shot dead. 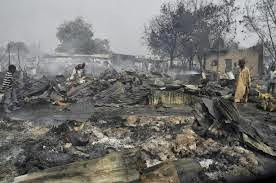 At least 300 people were confirmed dead with thousands of houses burnt and 200 cars destroyed. They didn't attack the villages but came to town. They shot everyone at sight. An outfit of the Nigerian Customs Service was also burnt. They spent 12 hours wreaking havoc on defenceless civilians, Senator Ahmed Zannah, who is from the area told BBC Hausa. He also pointed out that the attackers were armed with dangerous weapons comprising of Armored Personnel Carries , (APC), Improvised Explosive Devices, (IEDs), petrol bombs, assault rifles and Rocket Propelled Launchers (RPGs).